Marshall, Juanita, Gerry and I leave for the airport at 5 am via taxi. We decided to take a taxi because we were told that we needed to be at the airport an hour and a half before our 6:30 flight. We knew that leaving at 5:00 on the shuttle (which had to make other stops and may or may not leave on time) was going to be a huge cause for stress, so we paid all of $8 and took a cab. We were through ticketing and security with no glitches and then sat and waited for our flight. In retrospect, the shuttle at 5:00, late or not, would probably have been fine. Everyone else on our flight got to the gate a good 45 minutes later. Unfortunately the entire flight was cloudy or hazy so couldn’t see anything from the air until we got to Flores. As we were descending, we had a beautiful view of city of Flores out on the island in the lake. The cathedral looks so big compared to everything else, but probably because it is at the top of a hill. We found our guide in the airport and found out later that he is a son of founders of the Jungle Lodge (where we are staying). We drove around Lake Petén Itzá and stoped for a good look at it from El Remate. We continued on to the park (Tikal is in a national park) and to the lodge and check in. We had 15 minutes to drop off our luggage and then meet for our tour of Tikal. It is very hot here, but I am still thinking that it is no match for Puerto Rico, until I start to sweat. Who said you can’t wear shorts in Guatemala? You don’t need to in the highlands where it is cool (and often cooler than you think it should be given the distance from the equator). 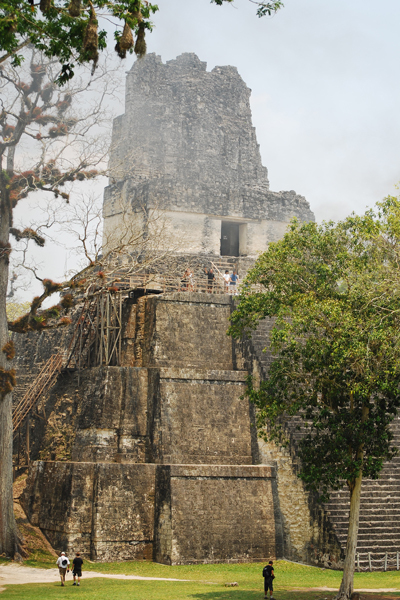 But here, in Tikal, shorts and tank tops are just plain practical! Just put on mosquito spray and go for it. This became more and more apparent to me as each day we were here it got hotter and hotter. Our tour is walking. With the hotel right in the park, it is just a hop to the entrance. Our guide is very good and quite interesting. He explained the Mayan system of mathematics and their calendar. Fortunately, Vinicio had given us an introduction to both. I think it is pretty complicated to grasp on the first telling. He also spoke to us about the causes of the collapse of Tikal, referring to Jared Diamond’s book “Collapse” which I had read and which is sold here in the bookshops. 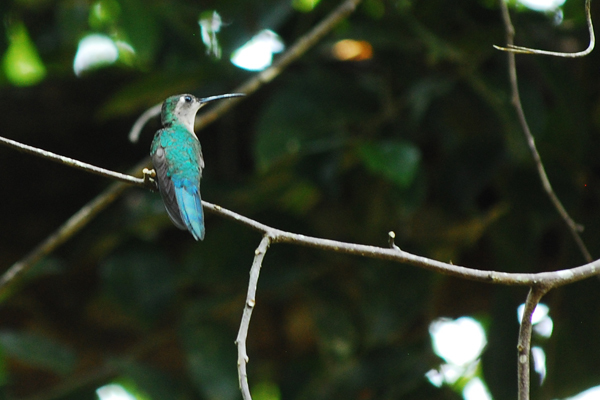 All around us is a symphony of jungle sounds, both insects and birds. There is one particular bird who sounds as if it should be a monkey (and later we hear a monkey that sounds like a tiger!). We are energetic today (and given that it’s the coolest of the three days we’re here, that’s a good thing) and we climb temples II and IV. Temple IV is the highest, but the climb is not so tough – the steps are wide and no steeper than a household staircase. The view is to the “grand plaza” below us where we have just witnessed a modern Mayan ceremony, complete with smoky black fire and kneeling, praying families. 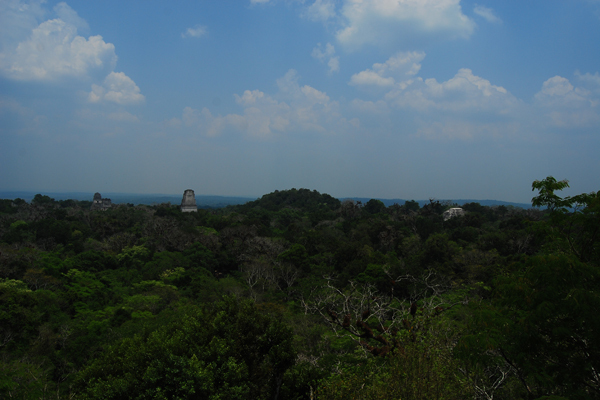 We can also see the classic view: Mayan temples protruding up through the dense jungle foliage. Our ride back to the Jungle Lodge was quite an experience…terribly bad and bumpy roads, on slippery, open jeep seats. I banged my shin twice before I finally got myself anchored in place (I was in the middle so had only the seat in front of me to hang on to). Lunch was included in the tour price (but it was not very good). In this heat, there is only one logical thing to do after lunch: Nap. Gerry and I wake up at 5:15 am for jungle walk at 5:45. We have coffee with Antonio, another one of the brothers who own the hotel, the sons of the original owners. Unfortunately, we get a late start because we have to wait for the others from our group, one of whom is late. Our group includes a couple from London and a young man from Scotland. We really enjoy the tour though it is not what we were sold, which was a wildlife and flora tour. We re-walk areas that we have already covered – Group G, Temple 5, Mundo Perdido and Temple 4. We climb temple 5 – very steep!!! And the view from the top is again – just a bit too high to be interesting – the accomplishment is in the climb. Antonio gave us more information on the Maya and lots of interesting information about the actual archeological work done at the site back in the 50s and 60s, when he was a boy growing up at the lodge. He knew lots of short cuts through the jungle. We went out too late for dawn photos but we had good light almost until the end. We got some glimpses of birds through the foliage, but basically there were no nature shots. We had breakfast back at the hotel with Juanita and Marshall. Gerry needed a rest (I think it is the heat and the sweating that really drains you). I walked around the grounds to try to get some photos, and I was somewhat successful with a hummingbird and a couple of really strange looking crested lizards. Of course, there were plenty of beautiful flowers, too. About 11:00 am, I wake Gerry up and insist he accompany me back to the site. My plan is to head toward Temple 6. It isn’t included on any of the tours, so I guess there isn’t much to see there, but I am thinking that if no one goes there, perhaps we’ll see wildlife. Along the way we happen upon a very extensive leaf cutter anthill. There are at least two streams of ants carrying leaves in, and one area where it looks like they are carrying some sort of reddish particles out. Our morning guide told us that the ants take the leaves into the hill and compost them to grow the mushrooms they use for food. Perhaps the reddish particles are some sort of used up compost that they no longer need. The path is a good one, but it is fairly deserted. We only see four other people during the entire walk and visit to the temple. 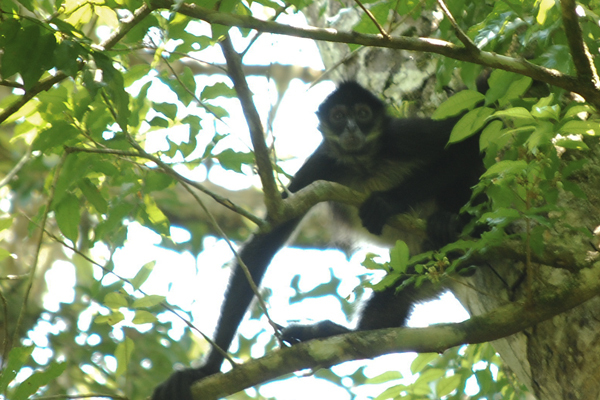 With a little patience I finally get some great shots of spider monkeys. There was one particular fellow who was grunting and growling up in the trees and then practically posed for me as he ate, hanging from his tail. It was a spectacle worth the walk and the heat. 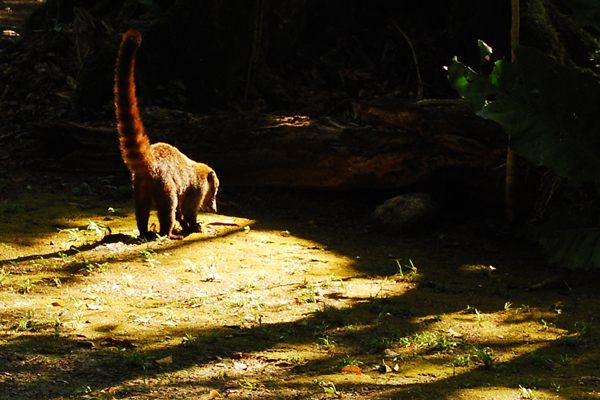 Other animals we have seen include various birds (Juanita got a great picture of a toucan – but I haven’t seen a one), the coatimundi (lots of them) and twice a little bush pig-like animal that I need to look up the name of. We walked back to the hotel to get cleaned up and check out. Since the food at the hotel is so mediocre, we walked down to the visitors’ center area and have lunch at the Comedor Tikal. The place is very simple and I enjoy looking at the photos of the archeologists who worked the site early on. I’d like to read more about that. It would probably make a good book! At 2:30 we catch our ride to Flores. There is lots of lively conversation in the bus – fueled of course by Gerry. Our companions are all known to us: George and Tom from the ride out to Tikal, Jennifer and Mary from our first morning’s tour. We apparently left without two guys, who caught up to us along the way (by truck – I can just imagine you thinking they came running behind us dragging their suitcases!). We dropped four of the passengers off at the airport, then drive to our hotel, Isla de Flores, also owned by the same group as the Jungle Lodge. The hotel is very clean and we’re ready for a rest. Hallelujah! AC! Blissfully cooler, we sleep. About 5:00 pm we meet Marshall and Juanita in the lobby and head out to explore our newest town. It is still hot though it is past 5:00 pm. We head down the hill from the hotel to the first cross street and then west toward the lake and the sunset. We locate our dinner destination (Capitán Tortuga) and then walk along the beach. The town reminds us of Rincón, in Puerto Rico. Very laid back. It’s a typical beach town. It is also really hot in the sun. Lots of people are swimming. I so wish I were too! Finally, common sense prevails and we decide to get out of the sun and we head back into the maze of streets where we hope to find some shade and a bit cooler temperatures. Many of the streets are completely torn up – apparently for new sewers and storm drains and paving. The good thing – no traffic! We walked up to the plaza. The plaza and the church are on top of a hill that is the island. The plaza isn’t too interesting. The people in it far more so: Like any beach town, there are hippies. From the plaza we walked down the other side of the hill towards the lake again. This would be the east side – so no sun and a nice breeze that cools at least when it touches your skin. We sat along the new “boardwalk” (though it is cement) and just watch the people who are there, some are tourists, many are in family groups. When we could stand it no more and had also seen basically everything there is to see on a Sunday night, we went to Capitán Tortuga’s for dinner via a walk around the southern part of the island. By the time we get back to the west side – the sun is setting and we are treated to a gorgeous sunset as we sip our “limonadas con soda y ron“! Still hot, though cooling off slightly – our talk centers on how thankful we are that the hotel has air conditioning. We shared “parrilladas guatemaltecas” – several different grilled meats with rice and “frijoles“. I stayed up to edit my pictures, but by 9:30 pm we were asleep again. I discovered that my pjs are missing and concluded that I must have left them in the bedclothes at the Jungle Lodge. I had taken them out to wear but it was so hot (no air conditioning there) I ended up sleeping in just my underwear. Not having checked the bedclothes before I left the room, I guess that is where the hotel maids found them. And concluding they were rags (they were very old, threadbare and soft) they are probably working away today cleaning something, someplace – a whole new life in Guatemala. “Today we are off to Ixpanpajul, a private nature reserve about 10 kilometers from here where we plan to walk through the jungle on suspension bridges. We’re hoping to see lots of wildlife.” That’s what I would have written if I were writing this before we went. Since I am writing it the day after I can tell you it was an adventure – but not because of the wildlife. The hotel arranged our transportation to the park, and then dropped us off, planning to come back and get us about 12:30pm (the drop off was at about 9:15). Oh, plenty of time – maybe too much we’re thinking… Well, it wasn’t too much. The walk was quite strenuous…walking across the suspended bridges was a breeze compared to hiking up the mountains and down the mountains on very rocky and uneven trails. There were steps, but I am not sure if it made things easier or worse. We didn’t see any animals, which was the big disappointment for me. We could hear plenty of birds and insects, but we saw nary a one. The vegetation was very thick in most places, but even the shade didn’t mitigate the heat very much and we stopped as often to cool down as we did to rest. When we finally arrived at the “mirador” where there was nothing but views and warm bottled water, we decided that Marshall and Juanita would take a truck back to the base. I wanted to continue since it was all downhill from there and I still had hopes of seeing something. Gerry accompanied me. Juanita and Marshall probably would have been better off staying with us as they had to descend a leaf covered trail that was quite treacherous to get to the pick-up point, and we had one last suspension bridge and then steps down, down, down to a nice road that is used for those who opt to go through on horseback. We saw almost no wildlife – just a pair of woodpeckers and a horse in a field. Back at the main entrance, Marshall, Juanita and Gerry each had a beer and we laughed at the monkey who was in the dining room up on the rafters. Apparently, he is well-known to the people who work there and is well-known for being misbehaved. He lives on a little island about 100 yards from the visitors’ center, and was chased back there and assisted across the moat with a wooden plank bridge that had obviously been used many times before for the same purpose. Both monkey and employee seemed to know the drill by heart! Back in civilization, we cleaned up and went to Capitán Tortuga for lunch – pizzas and beer! Then it was naptime (need I say again that the heat here is incredibly draining!). Juanita took off for an adventure of her own to have her hair done in Santa Elena via tuk-tuk! The hairdresser actually came to Flores via tuk-tuk to pick her up! All in all, tuk-tuks included, she spent less than $7. Can you beat that? Our evening’s entertainment involved a bottle of wine and a boat ride on the lake at sunset. Sound nice? It was. Our boat driver was very informative and we really enjoyed the sightseeing around the lake. The water was very calm and the air out on the lake was cooler (note: not cool) and refreshing. The driver dropped us off mid-bridge and we walked to the Santa Elena side to try Pollo Campero (the local version of KFC – now in 28 countries!) I hate to say it, but it was one of the best meals we have had in Guatemala – the food here has not been very good (and I remember that from my first trip here too). We have had really good food, but always in very exclusive restaurants, ie Casa Santa Domingo and Meson Panza Verde in Antigua. After Pollo Campero we walked back across the bridge to Flores, stopping in the middle to get ice cream from Sarita – purported to be great ice cream. It was! But it melted so fast in the heat, that we really had to eat it fast! Once again an early evening, Marshall and Juanita are leaving at 7:00 in the morning. Today it is so hot, that the residents of Flores are complaining! It is in the high 90s and it is impossible to even be outside! We try – we really do! Gerry and I got up to have breakfast and see Juanita and Marshall off to the airport. Our flight is this afternoon so we have the morning to kill. Our original plan was to visit the zoológico on the other side of the lake, but Gerry is losing steam fast. We took a walk while it was still relatively cool, keeping to the shade, and then went to the internet café to see what is up with the kids. No news from Oscar still, so Gerry woke him up with a phone call. We need to get back in the AC, so I wrote in the journal and edited pictures for Facebook while Gerry snoozed. I got a little itchy to do something, and mistaking the time on my computer I woke Gerry up and we showered and dressed for the day. Once out on the street I realize it is only 10 and not 11! We’ve checked out of the hotel. My idea was a bit of last minute shopping and a leisurely lunch before our shuttle to the airport, but rather than 1 hour to kill we have 2. In retrospect, I should have pushed for the zoo! We try, we really try, to do some shopping. We stay in the shade and stand, seemingly examine merchandise in front of store fans, but it is just too hot to live. We find a hotel (the one where the Petén Rotary meets) and sit down in the lobby restaurant for a long, and early lunch. Two of my favorite limonadas con soda later and a light lunch, we’re back out on the street. We buy the few things we need and then decide to go sit in the hotel lobby and wait for the shuttle. Just to prove there is a god who loves us, the young women at the hotel desk tells us that our room has not been cleaned yet and we can go back upstairs to the air conditioning for at 45 minutes! Halleluja! You can’t imagine what good news that was! We napped – I tell you the heat had us so energy-less we could have napped on the floor of the lobby! And then, we relinquished the air conditioning, and went back down to the lobby. We thought we had died and gone to heaven when the shuttle came for us a half hour early and we boarded it (thankfully air conditioned) salivating over the prospect of waiting for the flight in the comfort of an air conditioned airport terminal. It wasn’t to be. The airport in Flores is not air conditioned, and we joined the airport employees sweating on a bench in front of a fan that blew air over us, albeit hot air. Finally we boarded our flight (the plane is air conditioned –woohoo!) and fly back to cool Guatemala City – where everyone there is complaining about the heat, too! Yes, it was hot there too – for there – but it was still a relief from the heat of the lowlands! We cleaned up again and Sara’s drivers came to pick us up to take us to her house for dinner. Now it is cool, and I put on my long sleeves! Sara’s house is beautiful. It is simply laid out, and she has it beautifully decorated with local crafts, art and textiles. The house they rented in Puerto Rico was furnished, and they had decided not to bring their furniture from their house in Lake Forest to Guatemala, so Sara had bought all new furniture for this house and had it moved by Walmart (Bill’s employer). The house was not crammed with furniture as a result – adding to the feeling of airiness and simplicity I found so inviting. She gave us a tour of her garden. It is so great to be an eccentric in a foreign country! You can get away with it just because you are a foreigner! Sara is growing coffee, corn, pineapples, squash and more in her Guatemala City yard. Everyone in the household, maids, drivers and the gardener himself, are involved in this project and it bears “fruit”. We have a lovely delicious dinner of garbanzos and chicken, with a fresh salad I don’t think twice about eating. Then, the drivers are waiting to go home, and we don’t want to keep them too late. We say goodbye to Sara, and basically to Guatemala, for this trip. We were up early and on the 6:00 am shuttle to the airport. Today our flight is “late” – it is t 8:30 am! We meet a really nice couple in the shuttle – on their way to Minnesota for the summer, as they live in Rio Dulce. Our flight to Miami was uneventful, but the Miami airport has another long, long walk to immigration and baggage claim. I guess physically challenged people are not really welcomed to travel internationally. We’re stuck in baggage claim for about 45 minutes. The ramp is closed because of a thunderstorm and the luggage cannot be off-loaded from the plane. Our 2 1/2 hour connection time is rapidly being eaten up! Finally we’re through customs. We repack – the rum and whiskey Gerry bought in the duty-free in Guatemala has to go into the checked luggage for the remainder of the trip. Unfortunately, American has screwed up our upgrade request again, and Gerry is on the brink of a fight with the gate agent about it. Oh well, everyone on the plane arrives at the same place at the same time and it is only a 2 hour flight. We’re home by 7:00 pm! And so it ends, our Guatemalan adventure. I remain as in love with the country as I was after the first trip. Gerry is a convert (I had so hoped he would love it too!) and we’re planning to return. Would we do anything differently? For one, we would not go in May. May was the only time we could schedule this trip, and it was in no way a mistake, but one of the real experiences for me on my first trip to Guatemala was the absolute awe I felt when I saw all those volcanoes. That was missing from this trip. Because of the season, the volcanoes were shrouded with haze and clouds for all but one day in Antigua and the very early mornings on Lago de Atitlán. Ideally, our next trip will be much longer. I would love to visit every single town around Lago de Atitlan and be able to enjoy the sunrise over the lake to my heart’s content. I’d also like to visit the highlands around Quetzaltenango, and believe it or not, I’d visit Tikal again (Maybe in our winter months it will be manageable temperature-wise). Tikal deserves more time, and more time especially to be there early in the morning and late in the evenings. Although many of my friends are now of a mind to see everything in the world before they’re too old to enjoy traveling, I have always enjoyed revisiting places I have been, delving a little deeper each time into the culture and the life…I cannot wait to go back to Guatemala!